In 2006 and 2007, Peruvian President Alan García, U.S. President George W. Bush, and their nation’s respective congresses approved a free trade agreement intended to boost Peru’s economy, in part by opening up its national resources to American corporations and entrepreneurs. In speeches at home and in the States, President García and his spokespeople insisted that foreign businesses could count on the cooperation of a stable government, with no major internal conflicts. 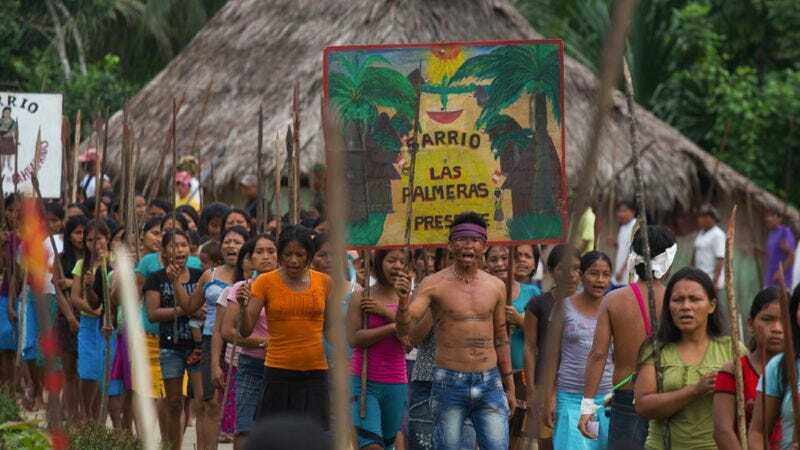 But not long after big trucks started rolling into the Amazonian rainforest, the indigenous population—led by activist Alberto Pizango—began to mount protests, arguing that the laws passed to facilitate the free trade agreement were in violation of preexisting treaties that gave the natives the right to control their land. Filmmakers Heidi Brandenburg and Mathew Orzel arrived in Peru right as the conflict over the Amazon was turning heated. 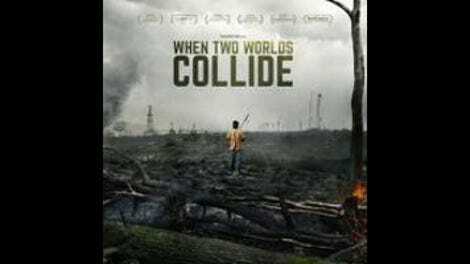 Their documentary When Two Worlds Collide tracks the story over several years, following it from the relatively calm arena of legislatures and television interviews to the bloody skirmishes between Pizango’s followers and the authorities. Brandenburg and Orzel clearly favor the protestors’ side in the dispute, but they pull back enough to show how a messy situation ends up splattering everyone with muck. In one especially deadly confrontation in the town of Bagua, the cops came down too quickly and too hard, and a lot of good men and women died—Amazonians and police alike. While the government tried to spin the story as a case of unreasonable savages slaughtering Peru’s finest, the pile of corpses raised questions worldwide about how a legal issue had abruptly escalated into civil war. When Two Worlds Collide employs a variety of styles and approaches to construct a single gripping narrative. Brandenburg and Orzel have local news footage, and interviews they conducted over time with some Peruvian officials and citizens. But more than half of the film is “direct cinema” style, using both high-quality cameras and smaller, lower-fidelity equipment to catch the action as it happens. The documentary opens with lyrical images of the rainforest, then becomes more jagged and messy as tempers flare, then calms back down to capture the long, tangled process of a nation coming to grips with what exactly happened in Bagua, and who should be held responsible. It’s that last third of the When Two Worlds Collide that sets it apart from a lot of other activist docs. One of Brandenburg and Orzel’s main characters is Felipe Virgilio Bazan Caballero, the father of a policeman who went missing at Bagua. García’s loyalists argued in congress and on television that Caballero should blame Pizango for inciting the violence that may have killed his son. But the father finds that explanation too pat, and wants to hear what the natives have to say about how they’ve been pushed around, by cops reluctantly acting on García’s behalf. That’s where it helps that the filmmakers spent so much time on the frontlines of this fight. They have the footage that shows protestors respecting and even chanting in support of the police, in the days before the crackdown came. Much of When Two Worlds Collide is about the effort to put forth a narrative that effectively demonizes people standing in the way of economic progress. In that way, the final form of the film ends up fitting what Brandenburg and Orzel originally set out to do: to document one community’s fight to prevent outside forces from illegally seizing their land. The social issues here are too complex to fit into one movie, no matter how much time the directors dedicated to understanding the story. But by focusing on both the factors that led to the Bagua incident and how Peru sorted through the wreckage, When Two Worlds Collide serves as a reminder that when it comes to a fight between government-backed business interests and the rights of the people, the official story is rarely the whole story.